Wales have been hit by a late injury ahead of their friendly against Austria at the Liberty Stadium, with Aaron Ramsey ruled out. The Arsenal midfielder has a calf strain and has returned to his club. Manager Chris Coleman, however, can call on a strong line up and is likely to pair Craig Bellamy and Gareth Bale. "In terms of quality and looking who's available, it's the strongest squad we've had," he said before Ramsey's late withdrawal. Striker Steve Morison, centre-back James Collins, goalkeeper Wayne Hennessey and defender Neil Taylor were already missing through injury. However Coleman has Bellamy and Bale both available for the first time since taking over as Wales manager. "They are such an offensive threat," he said. "We saw Bale score again at the weekend, so it's not just Wales that rely heavily on Gareth Bale, Tottenham Hotspur do now. "He's on good form. With Craig and Baley in the same team, you've always got a chance to give the opposition problems." Injuries have prevented Cardiff City forward Bellamy from playing in each of Wales' four 2014 World Cup qualifiers and doubts had surfaced over his international future. But the 33-year-old stressed on Monday he remains fully committed to his country, and Coleman has sensed renewed vigour in the former captain. "I've never seen him as relaxed as he is now," said Coleman. "I think he's in a good place." Collison has not played since the Gary Speed memorial match against Costa Rica in February 2012. The midfielder has been plagued by a knee injury, but returned to the West Ham team before Christmas and scored in their 5-1 defeat by Arsenal on 23 January. Wales have lost three out of four qualifying matches for the 2014 World Cup, their only win coming against Scotland in Cardiff. Bale scored both goals in that victory, adding to another spectacular strike in the 6-1 defeat by Serbia. No other player has found the net during Coleman's rein. Wales' next qualifiers are away to Scotland on 22 March and home to Croatia in Swansea four days later. 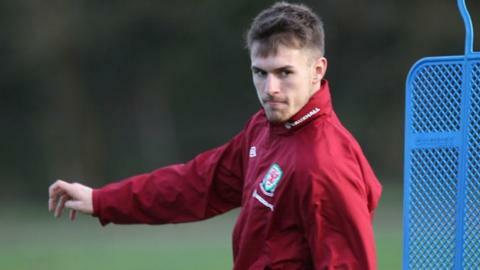 Wales (v Austria): Jason Brown (Unattached), Boaz Myhill (West Brom), Owain Fôn Williams (Tranmere), Ashley Williams (Swansea, captain), Jazz Richards (Swansea), James Wilson (Bristol City), Sam Ricketts (Bolton), Chris Gunter (Reading), Adam Matthews (Celtic), Ben Davies (Swansea), Jack Collison (West Ham), Andy King (Leicester), Joe Allen (Liverpool), Aaron Ramsey (Arsenal), David Vaughan (Sunderland), Joe Ledley (Celtic), Gareth Bale (Tottenham), Hal Robson-Kanu (Reading), Sam Vokes (Burnley), Simon Church (Reading), Craig Bellamy (Cardiff) Craig Davies (Bolton).